Conceptual art. Just the very mention of it can cause eyes to roll. It's nearly 100 years since Marcel Duchamp signed a urinal and declared it an artwork. Yet the subject remains just as divisive today. Tate Britain's latest exhibition looks at conceptual art in Britain, and how homegrown artists have contributed to this deep and ongoing genre. Their symmetrical, non-compositional, diagrammatic character was anathema to an understanding of a modernist compositional syntax that valued a quality of presence over process. This is nothing less than pseudo-philosophical claptrap. And it's everywhere in this exhibition, where relatively simple ideas are made needlessly complex. 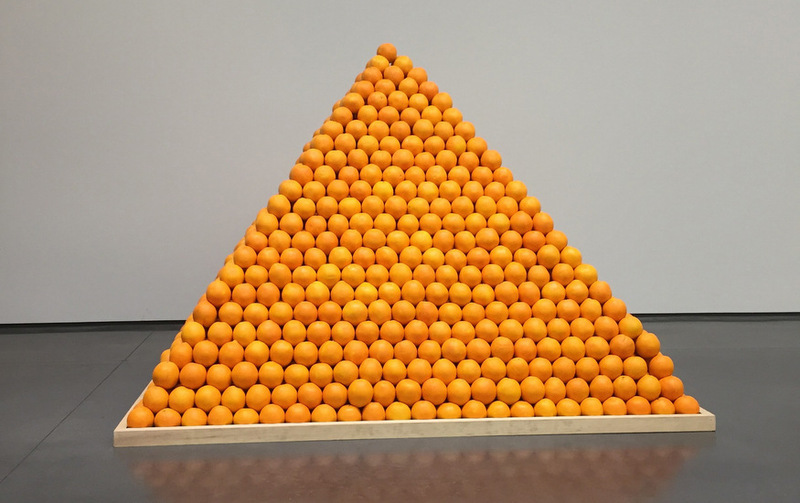 There are strong works in this show including a pyramid of oranges where visitors can take one away — an artwork that evolves with interaction and will inevitably decay. Plus we have a photographic series where Keith Arnatt* literally eats his own words. But the tasty stuff is outnumbered by a large proportion of works that require an explanation, and are not helped by the heavy handed text which accompanies them. We are staunch advocates of making art accessible and we're angered by how this show is riddled with unnecessary philosophy, thus making it near impenetrable. A public institution like Tate Britain should be about making art available to everyone. With this show it has missed a real opportunity to make conceptual art comprehensible. Here is an exhibition that suggests art is only for those steeped in art history and art philosophy. And that is unforgivable. Conceptual Art in Britain 1964-1979 is on at Tate Britain until 29 August. Tickets are £12 for adults, concessions available. Also on at Tate Britain is a spotlight on Tracey Emin's bed. Art fans should also check our top 10 and most talked about exhibitions for this month. * The original published article attributed this work to Keith Haring. It is now correctly attributed to Keith Arnatt.